Cheesy Crescent Scrambled Egg Casserole is perfect for a holiday brunch. 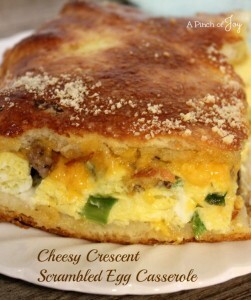 It is a nice alternative to the usual Egg and Bread Breakfast Casserole. The Cheesy Crescent Scrambled Egg Casserole is a party animal, especially if you use the optional egg wash to “make it pretty.” Serve with mixed fresh fruit, yogurt parfait, a light crispy pastry roll and a beverage bar. Beautiful and filling for a day of celebrating. This is a little “busy” to make, but so worth it. If you have hearty appetites – that’s this house! – plan on 9 servings instead of twelve. You might want two of these delicious casseroles for a brunch buffet because they will be back for more! You could brown the sausage ahead of time to make things a little easier. Also, buy the crescent sheets if you can find them. I don’t find them in every store – and sometimes a store that had them before, doesn’t have them when I am looking. I use a large cutting board, to seal the perforations of the crescent ROLLS, then turn the whole thing upside down over the casserole to peel the dough off the board onto the top of the casserole. The spreadable cheese comes in different sized containers, depending on the brand. This time I used Rondele garlic and herb, which was in an 8 ounce container and used about ¾ of it. Allouette is another brand, usually in a 6-7 ounce container, which also works well. Using an offset spatula (like a frosting spatula) works great for spreading the cheese. You can’t really taste the mushrooms – Bytes didn’t even notice they were there and he is NOT a mushroom fan! – but they add a nice depth to the overall flavor and texture. You can leave them out or substitute your choice of veggie. In fact, you could leave out the sausage and make the casserole entirely veggie! The egg wash makes the finished casserole pretty deep golden brown and makes the top crust moist which enhances the overall flavor and texture. And yes, it does reheat beautifully in the microwave next day – just in case there are leftovers. A deliciously layered breakfast casserole -- savory and filling! Set out spreadable cheese to reach room temperature ahead of time. Cook and crumble the sausage. Drain any excess fat. While sausage is cooking, saute the chopped green onions and mushroom in the butter, over medium heat and stirring occasionally, until they are just softened. In the meantime, whisk together the nine eggs with 3 tablespoons of milk. Add to sauted vegetables. Season with salt and pepper. Lower the heat and gently scramble the eggs for 2-3 minutes, until they are just barely cooked. Eggs will still be soft. Remove from heat. Press one can of crescent sheets into baking pan, covering the bottom and about halfway up the sides. If using crescent rolls, seal the perforations as you go. Spread the softened cheese evenly over the crescent crust. Spoon the gently scrambled eggs over the cheesy crust. Spoon sausage over the eggs evenly and sprinkle shredded cheese over the whole filling. Unroll the second can of crescent dough and place on top, stretching to fit and tucking excess down the sides. If using crescent rolls, seal the perforations first on a silicone baking mat or a nylon cutting board and then transfer to top of casserole. If using the optional topping, beat the egg with a fork in a small bowl and brush over the top of the casserole. Sprinkle with Parmesan cheese. This recipe looks delicious, def something I need to try for breakfast!